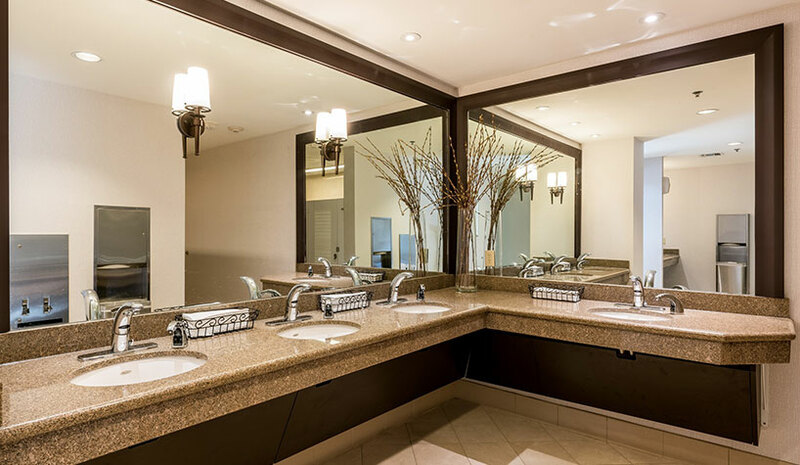 Southern California-based general contracting firm Bullseye Builders completed restaurant and restroom renovations to the Sheraton Park Hotel at the Anaheim Resort in Los Angeles, while the property remained open to hotel guests. The renovation project was completed in August and included updates to the hotel’s restroom structure and aesthetics. The restroom renovation followed a previous project Bullseye had completed at the location to update the hotel restaurant with a new buffet, flooring and seating. Provo Marriott Hotel & Conference Center has a new look following a redesign and renovation of the guestrooms and public spaces at the Provo, UT hotel. Following the renovation, the hotel has a new lobby, redesigned common areas and completely updated rooms. In addition, the concierge lounge received a transformation, along with the fitness center, 19 revitalized meeting rooms and an updated business center. The Des Moines Marriott Downtown in Des Moines, IA, has completed its renovation project. Symbolic of Iowa’s Midwestern roots, the renovation celebrates the region’s history and innovative future with a design that reflects Iowa’s farming identity through locally handcrafted artistry. This style, “Modern Americana,” reinvigorates the guest experience at the Des Moines hotel. The hotel has a newly transformed porte-cochere, a new lobby concept, reinvigorated guestrooms, elevated suites and bathrooms, and a new concierge lounge. In addition, the hotel’s new Mash + Marrow restaurant offers a locally inspired, modern twist on American classics. The Vinoy Renaissance St. Petersburg Resort & Golf Club has completed a multi-year enhancement and redevelopment project. The St. Petersburg, FL hotel transformed all 103 guestrooms in the Deluxe Tower. Well known for its architecture and tropical style, The Vinoy is a landmark in St. Pete, with intricate decor, elaborate frescos and the iconic pink facade. The latest redesign has enhanced these elements with newly modern decor and furnishings for the guestrooms, along with a redesign and reconfiguration of all bathrooms, allowing for larger showers, vanities and oversized closets. Elevator landings and corridors have also received a redesign to mirror the new style of the rooms and suites, as well as the terrace suite patios. Delta Hotels Chesapeake Norfolk in Chesapeake, VA, has concluded a total renovation, with contemporary design elements and new features. The new design includes reimagined rooms and suites. The property has also revealed new meeting and event space, consisting of nine venues for intimate gatherings and events of up to 800 guests in a theater setting, plus two outdoor terraces. The renovations also include dining options, including a Grab & Go Café, with coffee and breakfast items, along with the new Luminous Restaurant, which offers distinctive American fare with a local twist. Sheraton Hotels and Resorts, part of Marriott International, has transformed the Sheraton Grand Sydney Hyde Park with a $50-million renovation by owners Sunshine Insurance. With the refurbishment, the Sydney hotel, previously known as Sheraton on the Park, will also receive the brand’s ‘Grand’ designation.